We are commemorating 100 years since the end of the First World War and remembering the sacrifices made by people from the Sandwell area and all over the world. 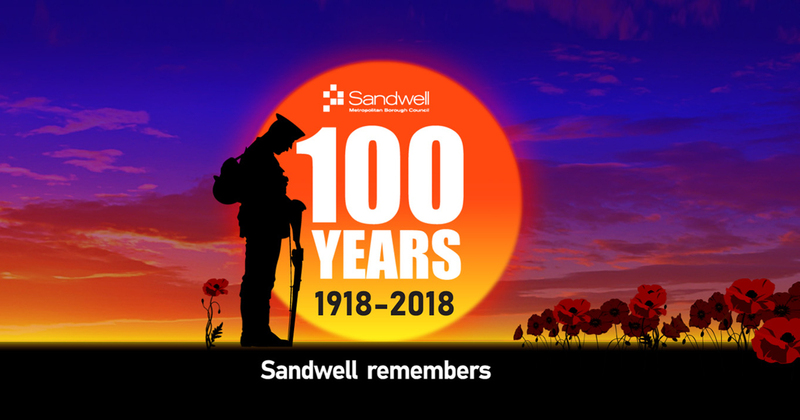 We've been holding a series of events, exhibitions and activities, including a special Festival of Remembrance on 10 November and Remembrance services and parades on 11 November at war memorials in each of Sandwell's six towns with armed forces and veterans' associations. 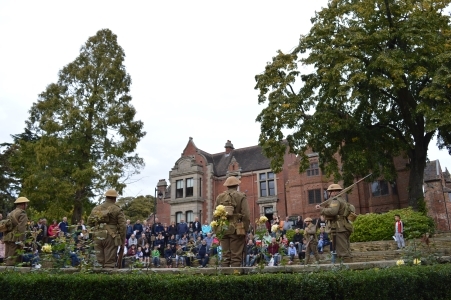 A wide range of events have already been held over the past four years, including 2018, to mark the centenary of the Great War. Sandwell also took part in the national network of beacon lighting, part of Battle's Over: A Nation's Tribute, on Sunday 11 November. 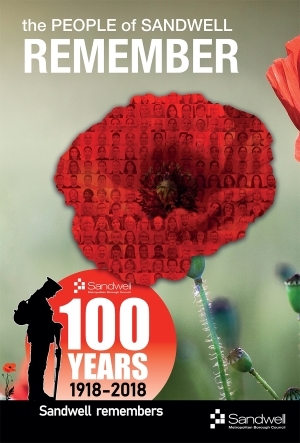 Museums, libraries and archives staff have run a poppy-related poster project, with Sandwell people having their photos taken or sending in selfies to create mosaic images of poppies that are now on display on posters and billboards across Sandwell. The poppy mosaic posters have also been sent to 1,500 addresses which were the homes of the next-of-kin of some of the many men from Sandwell who were killed in the Great War. The council has encouraged current occupants of these addresses to display a poster in remembrance. In November, libraries are holding a range of exhibitions, displays, coffee mornings and creative sessions with schools. There's a poppy wall in each library for visitors to put up paper poppies with names of loved ones. Haden Hill House Museum and Manor House Museum are holding Remembrance-themed activities and events in November. A knitting group and visitors to Oak House Museum have knitted commemorative poppies to decorate the oak tree in the old barn ready for the 100th anniversary of the Armistice. Meanwhile at Lightwoods House, more than a thousand handmade poppies have been unveiled to remember the injured soldiers treated there during the First World War. 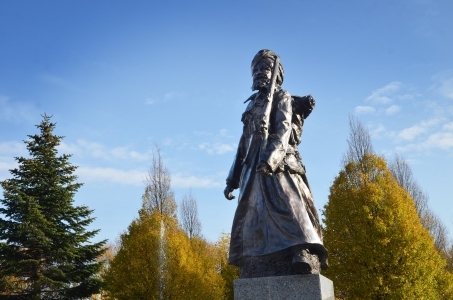 Guru Nanak Gurdwara Smethwick has worked with Black Country sculptor Luke Perry to create the Lions of the Great War statue in Smethwick High Street which was unveiled on Sunday 4 November in time for the centenary. Sandwell Council has worked with the gurdwara to create a paved public space with seating and lighting as well as improving an adjoining green space. Watch the unveiling on our Facebook page. The statue honours the sacrifices made by South Asian service personnel of all faiths from the Indian subcontinent who fought for Britain in the First World War and subsequent conflicts. Remember a family member, someone from your area or any of any of the fallen still to be remembered – create a lasting legacy at the Royal British Legion's Every One Remembered website. The Legion is working with the Commonwealth War Graves Commission to keep alive the memory of those who died in the First World War. By the end of the centenary this year, the aim is to ensure every fallen hero from across the Commonwealth is remembered individually by those living today. 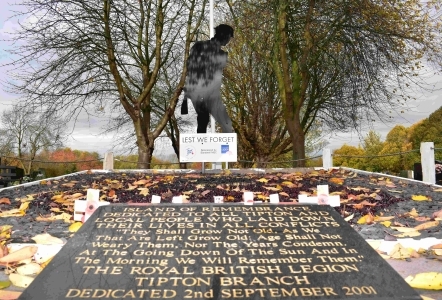 Sandwell Council is displaying soldier silhouettes from the There But Not There initiative in each of the six towns, including cemeteries and crematoria and near to war memorials. We have also identified and placed a tribute on First and Second World War graves in cemeteries managed by the council's bereavement services, cleaned war memorials and created flower beds cut out in the shape of the number 100 at several locations with flowers and Royal British Legion Remembrance tributes. Meanwhile, people with learning disabilities who attend our day services at Stoney Lane Day Centre, West Bromwich, have made two wonderful displays to commemorate 100 years since the end of the First World War. And in Wednesbury, the Friends of Brunswick Park, local councillors and the council's parks team have upgraded a memorial at Brunswick Park to remember the huge number of animals that served or died in wars.